Academics Stand Against Poverty is hosting a conference at Yale University on April 12-13 on the topic: “Global Poverty: What Do We Know? Where Do We Go from Here?” The first day of the conference will bring together development economists, World Bank experts, and development NGO leaders to discuss the future of global poverty alleviation after the expiration of the Millennium Development Goals in 2015. The second day will be dedicated to a workshop on how to effectively motivate individuals to act on their moral obligations to alleviate global poverty. The conference marks the one-year anniversary of Academics Stand Against Poverty (ASAP), an international network helping scholars, teachers and students enhance their impact on global poverty. Visit CAP’s new home in WCC. Learn about CAP law reform projects, events, and more. Doing something cool this summer? Want to turn it into a documentary? The Harvard Law Documentary Studio is now accepting project proposals for our 2012 Summer Projects. We’d like to support these Summer Projects by providing the student filmmaker with equipment (Panasonic DVX 100 camera, shotgun mic, tripod, boom pole and/or wireless lav mic), basic technical training prior to the summer, and potentially some financial support. After the summer, a film would continue to receive training and workshop support as one of our 2012-13 Annual Projects. The Emmett Environmental Law & Policy Clinic (ELPC) will accept up to three students to participate in the clinic for the entire year (Fall and Spring terms) for 2012-2013 and work on increasingly advanced projects. The three students must enroll in either Richard Lazarus’ class, Environmental Law (Fall 2012); Shaun Goho’s seminar, Environmental Advocacy: Citizen Suits (Fall 2012); or Wendy Jacobs’ seminar, Environmental Practice Skills, Methods, and Controversies: Siting and Permitting of a Wind Farm as a Case Study (Spring 2013), in addition to the clinic. Please email your resume and 1 page statement of interest to Wendy B. Jacobs, wjacobs@law.harvard.edu by Monday, April 2nd by 9:00am. Selected applicants will be notified by April 6th. The Environmental Law Program is offering four $7,500 fellowships to Harvard Law School students doing work within the public interest environmental law field during the summer of 2012. Qualifying work could include positions at government entities, NGOs, or other public interest organizations working on issues such as climate change, land acquisition and management, pollution control, energy, carbon trading, environmental justice, or biodiversity conservation. This is not an exclusive list of employers or fields, and students are invited to think broadly about work that might qualify. Applicants should be students who are returning to HLS in the fall of 2012. Experience with environmental law is not a requirement for the fellowship, and those new to the field are encouraged to apply. Applicants should first secure their summer position, and then apply for the fellowship; applications by students who have not secured a summer position will not be considered. The Environmental Law Program may be able to assist students in making contact with potential employers with which the Program has a relationship; students interested in soliciting the Environmental Law Program’s assistance in this fashion should contact Kathy Curley at curley@law.harvard.edu. Applications should include: a description of the organization where the student will be employed, a brief description of the summer projects the applicant will undertake, the name of the applicant’s supervisor, a resume, transcript, and a statement of interest conveying the reasons why the applicant was drawn to the job and any background the applicant has in environmental law. Applications should be submitted by April 18, 2012 to Kathy Curley at curley@law.harvard.edu. Successful applicants will be notified by April 30, 2012. Questions regarding the Covey Fellowships should be directed to curley@law.harvard.edu. “Introduction to Social Entrepreneurship” students present their Final Projects. Consulting John Newsome’s Public Equity Group, writing case studies describing some of the Group’s work with its clients. Drafting a summary of various legal forms enterprises can take to align the operations, management, and objectives of a business with the founders’ social mission. Consulting BUILD in Boston research, creating a robust Social Media Strategy. Over the past semester, Catherine Kim (a former student of the Introduction to Social Entrepreneurship course) has been working on a project researching how BUILD can transition to a more sustainable funding model. Small nonprofit organizations are typically able to meet their budgeting needs by motivating several individual donors, securing a small number of grants, or combining various types of funding sources to satisfy the organizationâ€™s overall need. However, as nonprofit organizations grow, such efforts are rarely sufficient to sustain large-scale fundraising needs. In response to this dilemma, The Bridgespan Group has produced the seminal guide, Finding Your Funding Model: A Practical Approach to Nonprofit Sustainability. This guide helps organizations like BUILD find their appropriate funding model(s) by: (1) analyzing the strengths and weaknesses of their current funding strategy, (2) identifying the preferred funding models that match the organization, (3) res earching best-in-class peer organizations within each preferred funding model, (4) evaluating the revenue-potential and costs of the preferred funding model options, and (5) developing an implementation plan for the selected funding models. Catherine has completed steps 1 and 2; she has also begun assembling contacts at various organizations for step 3. However, since Catherine is graduating, BUILD is now looking for another researcher to continue the project to completion. 2-4 independent writing credits can be given for this project, depending on the number of hours that the student is able to commit. The project also provides a fantastic opportunity to work closely with BUILD board members, as well as CEOs and development executives at major nonprofit organizations across the country. If you have questions or would like more information on the project, please contact Catherine at ckim@jd12.law.harvard.edu. Hanina Ben-Menahem, Caroline Zelaznik Gruss and Joseph S. Gruss Visiting Professor in Talmudic Civil Law, seeks a Research Assistant for approximately 20 hours of total work, beginning April 4th and ending by April 20th 2012. -The ability to read Hebrew and a familiarity with Rabbinical sources is required. -The work will include photocopying, retrieving books from Langdell library, and performing other administrative tasks in preparation for an upcoming conference. -The Research Assistant will be compensated at the Harvard Law School student research assistant rate of $11.50 per hour. HLS Roommate and Apartment Listings!!! The incoming students will all be using http://hlslist.com/ as their resource for off campus housing! Please make sure you use your HLS email address when signing up for the website. Only those with HLS email addresses will be able to access the website. Landlords who do not have an HLS email address should send their listing to housing@law.harvard.edu to have it listed for them. Please make sure to include price, location, type of apartment (studio, 1 bedroom, etc), any restrictions (no pets, no smoking, etc), and any other information you think would be useful. You may also include 1 picture with your listing. In January 2013 the Ghana Project will work in Ghana’s impoverished north on the rights and well-being of persons with disabilities. We will focus on the implementation of a new Mental Health Bill and community strategizing around Ghana’s recent ratification of the Convention on the Rights of Persons with Disabilities. The work will address a range of development and human rights issues, such as access to health care, inclusive education, and a livelihood, the right to live with dignity in local communities, and the rights to vote and participate in policy formation. Specific clinical activities include legal research and analysis; drafting regulations; strategy mapping; documenting human rights violations; community-based research; and conducting grassroots education workshops, town meetings, and policy briefings. To apply send a 1 page CV and 2 page statement of interest to Professor Lucie White (lwhite@law) and Ellen Keng (ekeng@law). Applications due o n March 30. An Information Session will be held on Wednesday, March 28 at noon in Griswold 511. HIRC will accept two students to participate in the clinic for the entire year (Fall and Spring terms) for 2012-2013. Students will will attend the seminar and participate in the clinic in Fall semester and then continue with the clinic during the Spring semester working on more advanced immigration and asylum issues, including direct representation, amicus briefs, and/or policy and advocacy. Please email your application — CV and 1 page statement of interest — to Bonnie Rubrecht at brubrecht (at) law.harvard.edu by March 30. Selected applicants will be notified by April 6.
er and resume to Sabi Ardalan at sardalan (at) law.harvard.edu. The deadline for submitting applications for the Ghana Project is FRIDAY, MARCH 30, at 5:00 pm. Email your application — a one page CV and a 2 page statement of interest — directly to Professor White ( lwhite at law.harvard.edu) as well as Ellen Keng (ekeng@law) and the clinical office. Accepted students will be notified by Monday, April 2 at noon. An information session about the course will be held in Griswold 511 at noon on Wednesday, March 28. See the course description for more details about the course. Harvard Negotiation & Mediation Clinical Program Open House! The Harvard Negotiation & Mediation Clinical Program provides HLS students with practical, real-world experience in the fields of negotiation, dispute resolution and conflict management, with a focus on conflict mapping and dispute systems design. Students in the program are paired with outside corporations, government agencies, religious institutions, NGOs or individuals on real projects related to negotiation, mediation, and conflict management. Client list includes Hewlett Packard, The Roman Catholic Church, Michigan State University College of Law, U.S. Office of Special Counsel, Consumer Finance Protection Bureau, Chilean Ministry of Justice, American Red Cross, and the National Institutes of Health. Deadline to sign up for the Williston Negotiation Competition is this Friday, March 23! You must be registered to participate in the competition. What is the Williston Competition? The annual Williston Negotiation Competition is Harvard’s annual negotiating exercise for 1Ls. Teams of two, representing each side in a contract negotiation, work on a complex, realistic business problem. At the end of the competition, both teams submit a contract and each team also submits a private memo to its client, explaining why the client should agree to the contract. – Experience: Lawyers negotiate as a routine part of their work. Whether they’re negotiating a big M&A transaction, a settlement between a landlord and tenant, or an investigation with the government, negotiating skills are critical. The Williston Competition is a realistic simulation that will let you see what you like and don’t like about negotiation and help you start learning to be a great negotiator! – Glory: Each year’s winners are immortalized on a plaque in Langdell Library. – Prizes: Winners also receive cash prizes. When is it? This year’s competition will start with an introductory meeting at noon on Thursday, March 29th. Completed contracts and memos will be due at 5:00 p.m. on Thursday, April 5th. Teams usually spend as little as 10 and as much as 20 hours over the course of the entire week, and you can make whatever schedule you want. Who can participate? All 1Ls can participate. All you need is a partner. If you would like to be assigned a partner, you may register as an individual. You do not need to have taken the Negotiation Workshop. How do I sign up? Simply register (sign up once per team) at . The deadline to register is Friday, March 23. Harvard Defenders is accepting applications for the final spot for the Litman Summer Fellowship Program. Fellows have the unique opportunity to handle all their own cases and advocate for their clients in the Boston area’s criminal courts. Fellows will also write an academic paper under the supervision of a faculty member. Fellows will be awarded $1000 in addition to SPIF funding. Interested candidates should submit a cover letter and resume to dstern@jd13 and jmachlin@jd13. Please join us as we demonstrate how to submit preferences in HELIOS, as well as, answer all of your registration questions. In 2012, What Is ‘Good Work’ in the Law? The Goodwork Project is a large scale effort to identify individuals and institutions that exemplify good work – work that is excellent in quality, socially responsible, and meaningful to its practitioners – and to determine how best to increase the incidence of good work in our society. 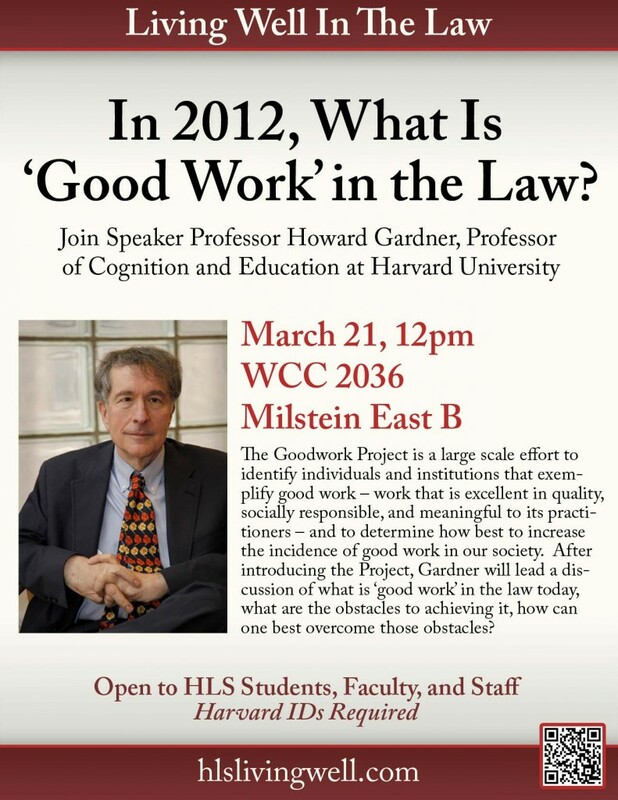 After introducing the Project, Gardner will lead a discussion of what is ‘good work’ in the law today, what are the obstacles to achieving it, how can one best overcome those obstacles? Please join us! Hors d’oeuvres will be served. This is a Harvard University only event. The 2012 Symposium will be held on Friday, March 23, at 4 pm and Saturday, March 24, at 8 am. It features 5 moderated panel discussions, two keynotes, as well as meals and a cocktail reception (free for students). It will showcase the contributions of the Harvard Business Law Reviewâ€™s (HBLR) authors from 2011-2012. In addition to HBLR authors, HLS and HBS professors and distinguished practitioners in the fields of law and business will be in attendance, including representatives from notable private and public sector institutions. While we hope that you will attend both days of the Symposium (three of our most interesting panels will take place on Saturday), we specifically encourage 1Ls to attend the Friday, March 23 panels and to register to attend the Cocktail Reception that evening, as some of the most prestigious law firms are sending representatives to meet 1Ls prior to the OCI process in August. If you plan to attend, please RSVP at http://www.hblr.org/symposium/register/ to ensure that you have a nametag at the reception. Detailed information regarding the agenda and logistics is available on this website, and a final list of panelists, keynotes, and firms represented at the Symposium will be available shortly. For any further inquiries, please email symposium at hblr.org. Tuesday, March 20, 2012 is the first day of spring, a perfect time for new beginnings. There is no better time (and in fact, no more time) to turn in your proposal for the President’s Challenge and start a new phase of development for your idea that creates social impact. $50,000 will be distributed to ten finalist teams in the first week in April. They will receive expert mentorship and the full resources of the Harvard innovation lab to further develop their ideas. $100,000 will be distributed in late May to one grand-prize winner and up to three runners-up. If you’ve been working on an idea but were not sure of its suitability for the Challenge, it’s not too late. Contact Challenge Coordinator Kate Range at katherine_range@harvard.edu to ask any questions regarding eligibility, suitability, or application requirements.